Mark McGwire was once considered to be among the greatest home run hitters ever and the man that saved the sport of baseball. Although his reputation has fallen off, he still remains a popular figure in the trading card market. 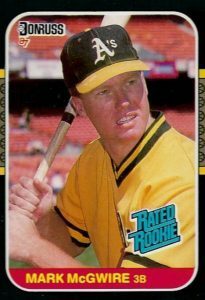 In this list of the best Mark McGwire baseball card appearances, we highlight cards from throughout his career including his legendary Topps rookie card. McGwire earned the nickname "Big Mac" as everything about him was huge, from his 6'5" physique to his statistics on the field. In his first full MLB season in 1987, McGwire drove in 118 RBI and hit 49 home runs, which is still a rookie record for homers. He was unanimously named American League Rookie of the Year and continued to perform strongly over several seasons. This included being the first player to hit 30-plus home runs in their first four full seasons in the majors. Shop for Professionally Graded Mark McGwire cards on eBay. During 1993 and 1994, McGwire was hampered by injuries and he was forced to sit out most of each season. However, beginning in 1996, McGwire embarked on a home run streak that had never been seen before. He led the league in home runs from '96 to '99, becoming the first player with four consecutive 50-plus home run seasons, and hit a combined 245 home runs over that period. This all culminated in 1998 when he broke Roger Maris' single-season home run record with 70 home runs. While those popular years made McGwire a true star, rumors persisted about his steroid usage. Following the publication of Jose Canseco's autobiography in which Jose said he personally injected McGwire with steroids, the case grew stronger that Mark had been using PEDs during his career. In 2010, McGwire admitted to using performance enhancing drugs for most of his career to help him recover from injuries more quickly. This brought into question his super-human performance with the St. Louis Cardinals after his injury-filled seasons with the A’s. Of course, this severely damaged his case for election into the Hall of Fame and unless the voter's opinions change in the near future, it looks unlikely he will be get the required votes. Just like his career, the card market for Mark McGwire has seen some major ups and downs. Like most players, his earliest cards and autographs remain in greatest demand. While McGwire’s certified autograph was once one of the tougher pulls during his playing days, he has started signing for both Topps and Panini products. Collectors can chase certified McGwire autographs in 2016 Topps Stadium Club, 2016 Topps Tribute, and 2016 Panini Flawless. Perhaps no other player has had their cards go through such a value fluctuation over the course of their active career and subsequent retirement. 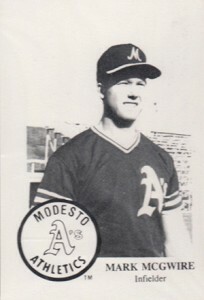 In formulating this top list for McGwire, card value was used as the main component along with graphic design and the card's historical importance. 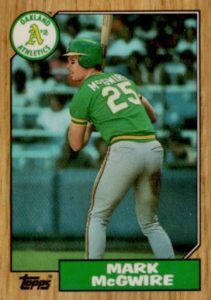 While Topps was able to feature McGwire as early as their 1985 set because of his Olympic appearance, Donruss would have to wait until their 1987 set once he debuted with the A's for 18 games at the end of the 1986 season. Donruss named him as a "Rated Rookie" and the appearance has developed into the most valuable non-Topps card from McGwire's first MLB season. The card is only equaled in value in the set by Greg Maddux's rookie card. To honor the amazing home run chase in 1998, Topps used a unique card design for both McGwire Sammy Sosa in 1999 Topps Chrome. Each of McGwire's 70 home runs were given there own individual card variation with super collectors trying to track down each edition. Collectors have placed a high premium on the cards highlighting McGwire's home runs that tied and broke Roger Maris' single-season record (home runs #61 and #62) as well as the card for his last home run of the record-breaking season (#70). McGwire has one of the most memorable 1991 Topps cards as he is captured sliding into third base. 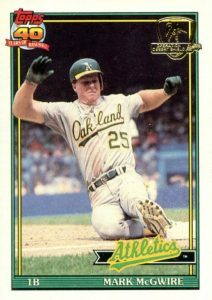 With just 12 career stolen bases, McGwire was never a speed threat like his Bash Brother, Jose Canseco, so it is rare to see him sliding on a baseball card. Topps does an excellent job making McGwire look like he was coming out of the card as his image is placed in front of the border design on left side of the card. The limited version below originates from one of the 6,800 sets that Topps made available to military members involved in Operation Desert Shield. 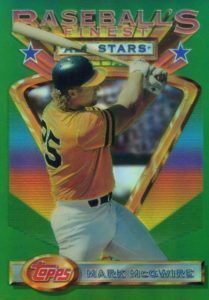 The gold stamping on McGwire's card also works very nicely with the yellow and green color scheme the A's cards had in the set. After debuting in 1985 Topps, McGwire didn't appear in the 1986 set and collectors wouldn't find his second Topps appearance until 1987 Topps. Some may question why Topps didn't give McGwire a "Future Stars" designation as they did for several other prospects and, looking back in hindsight, they certainly should have. The premier edition of this card to collect is the Tiffany version which features a high gloss finish and was printed on white paper. The 1987 Tiffany set is not nearly as rare as the earlier releases with six times as many sets produced in '87 (30,000 total sets) compared to the previous two years (5,000 sets). 1997 Totally Certified is an all-insert product that doesn't not have a traditional base set to collect. Each of the 150 players featured have three cards to chase: Platinum Red, Platinum Blue, and Platinum Gold. Red cards were found in every pack and numbered to 3,999 copies, while more limited Blue (#/1,999) and Gold (#/30) parallels could be pulled as well. Although all three versions (with the protective plastic sheet still in place) remain popular with collectors, the Platinum Gold parallels have proven to be some of the most valuable cards of the era. The 1993 Topps Finest set has a 33-card subset in the middle of its checklist that features All-Stars from both leagues and that is where you will find McGwire's card. Refractors averaged roughly two per box and each was limited to about 250 cards, although the exact number is unknown. Every box also came with a jumbo All-Star card. This oversized subset included McGwire and the estimated production run is approximately 1,500 copies. 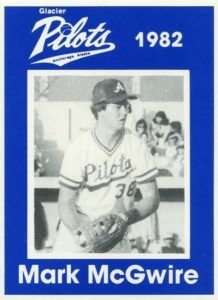 Collectors interested in obtaining the earliest baseball card available for Mark McGwire can look all the way back to the 1982 Anchorage Glacier Pilots set for Big Mac's first card. 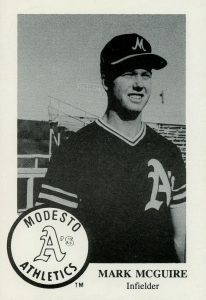 McGwire was attending the University of South California at the time and the Glacier Pilots were a summer league team in the Alaska Baseball League. 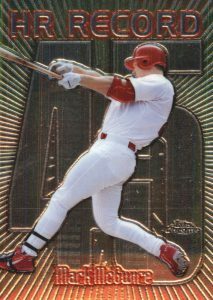 Interestingly, McGwire is listed as both a first baseman and a right-handed pitcher on his card, giving collectors a neat oddity. As McGwire's early cards exploded in popularity in the late 1990s, his pre-rookie, minor league appearances were counterfeited very frequently, including these two cards from his days with the Modesto Athletics. As you will note, McGwire's name was originally misspelled as "McGuire" and the incorrect version is less common. Collectors should only consider buying authenticated versions of this card as both spelling variations have been duplicated with great precision. 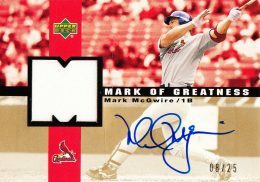 For many years, McGwire's autograph was very difficult to find and it wasn't until 2002, when McGwire signed an exclusive autograph deal with Upper Deck, that his certified autographs became more common. 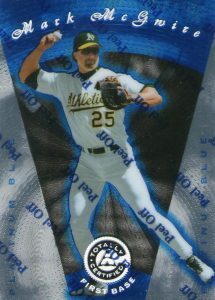 He was featured in several 2002 Upper Deck products such as Ovation, SP Authentic, and 40-Man, which included several buyback autographs of his early Upper Deck appearances. Those early autographs are quite rare and rarely surface on the secondary market. The combo card featured below came in 2003 Upper Deck and includes an on-card autograph and jersey swatch. Few modern cards have ever rivaled the celebrity and popularity of Mickey Mantle's 1952 Topps card. 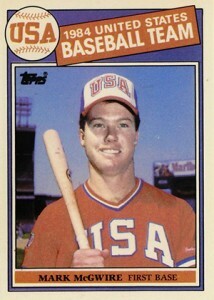 McGwire's 1985 Topps rookie card is one such option that arguably managed this feat for a period. His rookie, which is part of a subset featuring members of the 1984 U.S. Olympic team, commanded some of the highest prices ever paid for baseball cards during the first few years of the 21st century. The high gloss Tiffany version of the card yielded the tip-top prices. While those days are long gone, even now it can produce $200 at auction. I have a card a mark McGuire card that aint on here its a hot shots card pink n white is it valuable ? I have a 1987 Mark Mcgwire first baseman that i dont see on your list. Its no 1donruss diamond kings first baseman. Its worth? ?